Have you ever walked outside one morning to see your vehicle covered in dust and dirt, almost as if you had just gone for spin in the sand? Arizona is DUSTY. 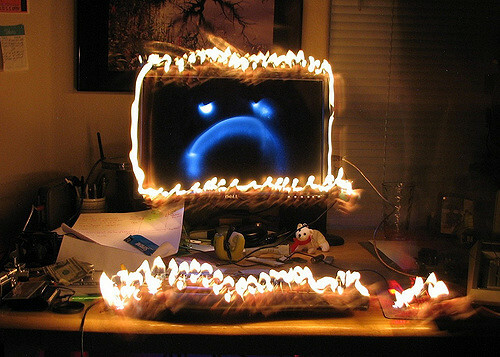 If you have a computer, it’s more than likely that it too, can be covered in dust. Your computer has several little fans that push and pull air through the case whether or not it’s a laptop, tower, or All in One PC. It’s insane what kind of stuff can happen to your personal computer if it continues to go untreated. Gilbert Computer Repair Service is here to help with that. Is your computer running slow? Believe it or not, it could be due your fans being clogged full of dust and debris that gets caught between the heat sink and fans in side of your computer. When your computer reaches a certain temperature, it chooses to throttle multiple different parts of your PC in order to keep it at a safe operating temperature. Unfortunately though, these parts can also go bad and their sensors can get old and not work anymore which could lead to further harm. Dust is highly combustible in enclosed locations, and can lead to injury, and sometimes, house fires. If you are concerned about this problem, drop us a message and have one of our field engineers come out and check out your computers to ensure you are running efficiently and optimally.